1. Cook the linguine. Meanwhile, cut the goats cheese into small pieces and slice the tomatoes into quarters. 2. Drain the pasta, reserving a little of the cooking water. Stir together the lemon juice, egg yolks and crème fraîche, pour into a warm pan along with the olive oil and Parmesan. 3. Mix the cooked pasta into the mix with tongs, adding a little of the cooking water, if needed, to make a creamy sauce that coats the pasta. 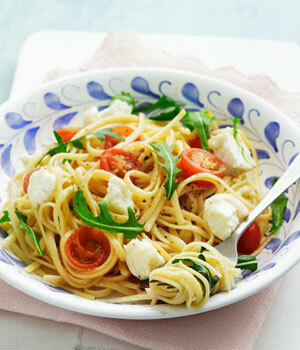 Scatter the goats cheese and tomatoes over the and toss together lightly. Sprinkle with the left over Parmesan and enjoy!